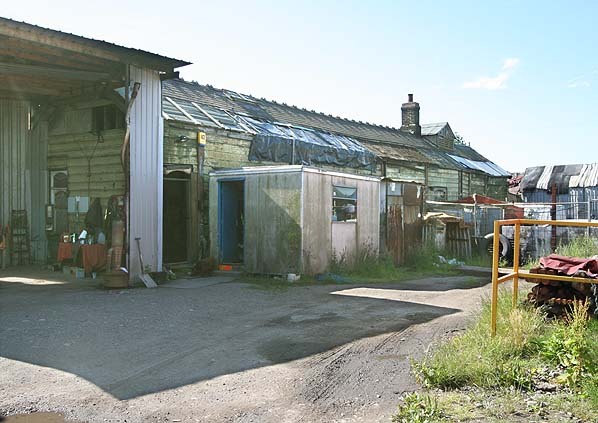 Present state: The timber up platform building survives in a run down industrial estate. Internally the building has been gutted and it is now split between two tenants. One part of the building is used as a workshop. The stationmaster's house is in private occupation within the industrial estate. Notes: Sheepbridge and Brimington Station opened to passengers on Saturday 4 June 1892 along with the majority of the Chesterfield branch, though portions of the Derbyshire lines had been opened earlier for goods. The opening to passengers had been delayed from Wednesday 1 June until the Saturday owing to the inspecting officer from the Board of Trade not being satisfied that work was sufficiently advanced at Staveley Works and Chesterfield stations the two stations either side of Sheepbridge & Brimington. 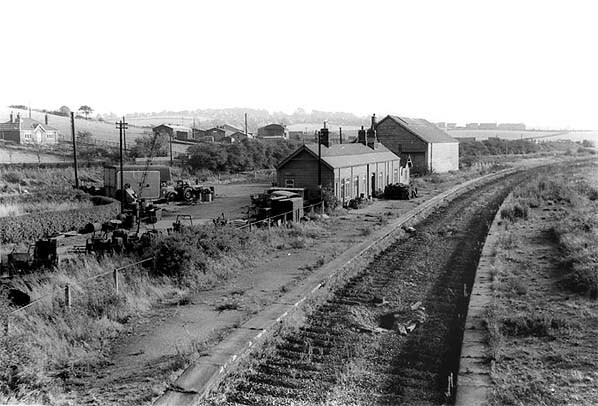 The station was a typical MS & LR station colmprising wooden buildings on both platforms and a goods yard, with shed, 10-ton crane, cattle docks and signal box with the stationmaster’s house alongside the approach road. On the approach road, almost immediately at the entrance off Station Road there was a weighbridge and office. Passing these, the yard opened out, with the stationmaster’s house to the west. Two cattle pens followed shortly, to the east. Sidings ran in from the main line into the yard. 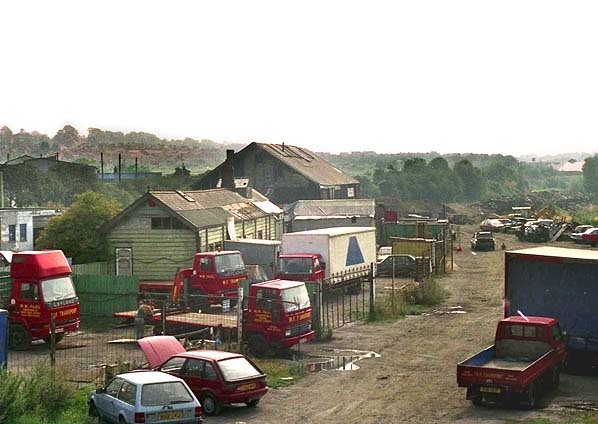 A large wooden goods warehouse, towards the end of the yard. These were cantilevered on a central row of columns, the platform ends having decorative valances. These, like some other Derbyshire line canopies, were bevelled off and partially re-roofed with asbestos corrugated sheets sometime after the grouping of railways in 1923. There were the usual toilets and waiting rooms. The up and down platform were linked by a lattice iron footbridge. 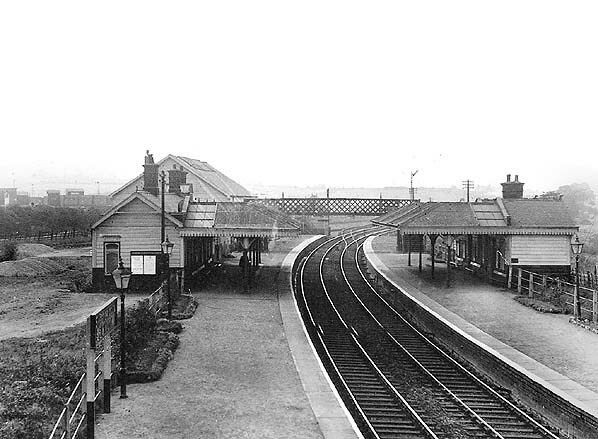 To the south end of the station, just off the up platform was the small wooden signal box, which would have controlled points and signalling into the goods yard and on the main line. There were crossovers just in front of the ‘box joining the up to down lines, connecting into the goods yard from the down line. There were a couple of head-shunts to the south of the up line to enable access into the goods yard, particularly from the down line. The station was renamed Brimington on 18th June 1951. After WW2. It was clear that the local service had experienced years of being run-down. As motor bus services and car ownership grew, the need for a station, some-way from any real centre of population, diminished even further and the service was further reduced with nine daily trains in each direction on weekdays and no Sunday service. It was clear that the station's days were numbered. 'guaranteed excursions’ were special trains run usually for interest groups such as working men’s clubs, Sunday Schools, etc. These could be run from closed stations, subject to the need and until the station in question became unsuitable. There is some oral evidence that such trains may have run from Brimington, but no documentary confirmation. By now service then consisted of five weekday trains in each direction, with seven on Saturdays and no Sunday service. A census taken during the week ending 18 September 1954 lists an average 38 fare-paying passengers had joined trains each day, with 26 alighting. On the Saturday 18 had joined with 28 alighting. Railway employees accounted for a further 15 joining, and 14 alighting, per day, with 13 joining and 12 alighting on the Saturday. There was no campaign to keep the station open. Newspaper coverage of the closure, such as it was, seemed to spark little or no reaction in Brimington . The parish council raised no objections to the proposal, as facilities would be retained for dealing with guaranteed excursions. They did, however, feel that there should be an "assurance that the platforms will be retained" which was agreed. Closure was announced on and from Monday 2nd January 1956. As there were no Sunday services, this meant that the last service to leave Brimington Station would have been on the evening of Saturday 31st December 1955. 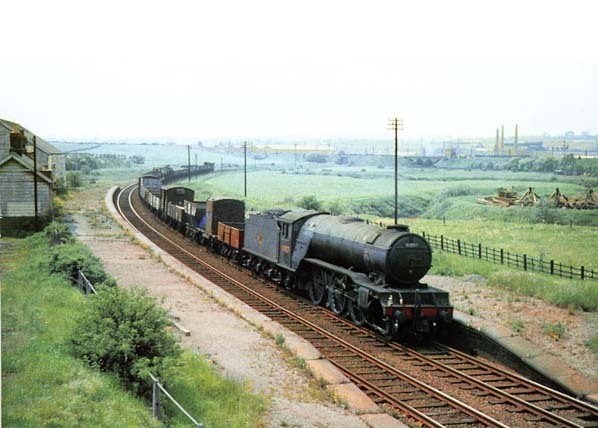 It is not known whom the ‘private sidings’ were intended for, but in any case annotations to the official mileage diagram for the Chesterfield loop in the National Archive indicate that all the station sidings and the signal box were abolished in March 1956. This included the connection to up and down lines between the platform. The platform awnings and the down side buildings were removed before July 1959.
the Metropolitan Railway from Harrow to the junction north of Finchley Road, enabling more traffic to use Marylebone. Although the new line had now reached London, Edward Watkin was unable to fulfil his ambition as he was forced to retire through ill health.From the outset, the line had to compete with established north – south routes and the first train only carried a disappointing four passengers so the company had to work hard to win passengers from its rivals; with a well managed Advertising campaign and the introduction of a fast and efficient train service the companies fortunes slowly improved although it was never a match for its rival lines. Selected further reading: Great Central Memories by John MC Healey published 1987 by Baton Transport ISBN 0 85936 193 4 - heavily illustrated history of the London Extension. Great Central Then and Now by Mac Hawkins - published (2nd edition) by BCA 1992 ISBN 0 7153 9326 X , station by station photographic survey of the Great Central between Sheffield and London with numerous 'then and now' photographs. See also Sheepbridge & Brimington Station and construction of the Manchester, Sheffield and Lincolnshire Railway through Brimington by Philip Cousins. Published in St. Michael & All Saints, Brimington parish magazine. (Click here for full text). Tickets from Michael Stewart & Glynn Waite. Route map drawn by Alan Young.